The requirements for a new offices building were painfully and tediously hammered out in London throughout the early-1950s. Numerous other government departments had their own fiefdoms in Washington, many of them dispersed in rented offices in the city. The eventual requirement was for about 550 desk-bound staff. In the Ministry of Works, Eric Bedford had been promoted from Assistant Chief Architect to take over from Arthur Rutter as Chief Architect in late 1951, and the new Assistant was Richard Turner. Rutter and Turner visited Washington together for a couple of weeks in October 1951. They estimated that the total cost of an appropriate new building would be the enormous sum of £0.75-1.0 million. In the opinion of the Commission, any attempt to design this new building in the Lutyens’ manner, or, as proposed, in some modified form of it, is undesirable. The Embassy as it stands was an attempt to produce an outstanding building. Questions of prestige are involved, and it is therefore important that the same intention should be shown in the present proposal. Such a change of architectural policy might well affect the general massing of the proposed building, as well as its detailed treatment, although the Commission agrees that there is great advantage in keeping the new block reasonably compact. It is therefore recommended that the scheme should be reconsidered, and the Commission would be glad to discuss alternative sketch proposals as soon as they are available. The Foreign Office then asked for an even larger building and Bedford was forced into some re-planning anyway. The Commission saw the scheme again in February 1955 but to no greater effect. This time the minutes recorded ‘A revised design for the office block was considered below the required standard, and the employment of an independent architect should be recommended’. The Secretary’s letter to the Ministry was gentler: ‘… the Commission … is still of the opinion that the building should be of our own period but is not satisfied that the architectural handling is up to the standard required for the most important work’. This letter paved the way for a private exchange of correspondence, and a meeting, between the Commission’s Chairman, Lord Crawford, and the Minister of Works, Nigel Birch MP. The resulting impasse was resolved by taking the hard-bitten tactical advice of Bedford’s boss, Sir Charles Mole, the director general of works. He advised ignoring the Commission for the moment, developing the scheme a bit, taking it to America to show the Americans and the ambassador and then, if both were favourable, go back to the Commission. The Minister approved submitting the next design to the Commission in October 1955. The minutes recorded ‘A revised design was considered acceptable in its general lines, but further consideration should be given to the treatment of the roof structures and other points of detail’. That was good enough for the Ministry: it had no further contact with the Royal Fine Arts Commission on Washington. 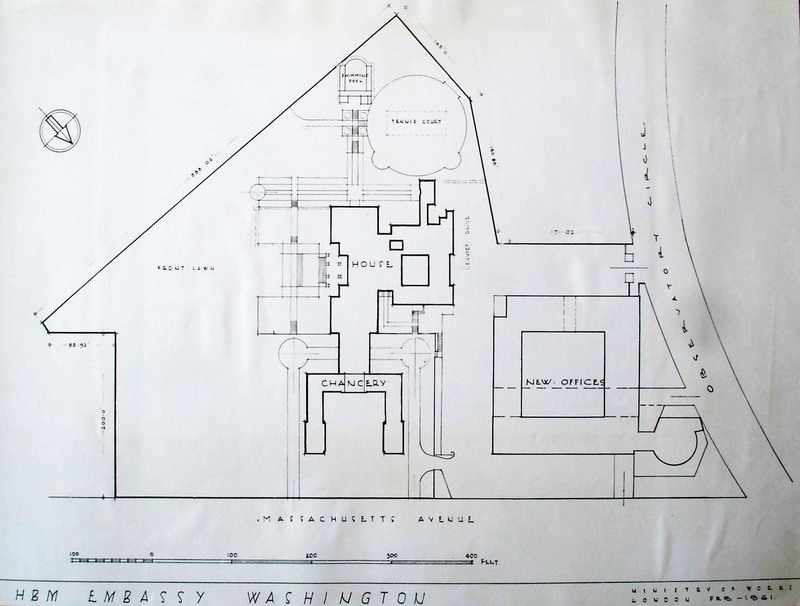 Bedford took the scheme to Washington in April 1956, primarily to show the ambassador, Sir Roger Makins, who answered the foreign secretary’s request about what he thought of the plans with ‘they looked too much like a modern factory to fit well into that part of Washington’. The sketch plans were nonetheless accepted and a £1.0 million cap was set on the cost. This brought cost-saving measures into consideration, including eliminating the underground passage between the new and old buildings and instead including a study for the ambassador in the new building, accessible by a private back door and stair. The design was a four storey hollow square, with two more storeys over the north-west side of the square, and three more over the north-east side. Edwin Muir, the new permanent secretary at the Ministry of Works, went to Washington in May 1957 to show the scheme to the various semi-official bodies and to prepare the way for construction. He and the ambassador, Sir Harold Caccia, squeezed the scheme past these bodies, none of which much liked it but none felt on sufficiently firm ground formally to make a fuss. The Washingtonians subsequently tightened up their planning regulations to avert a recurrence of such uncertainties. A final hurdle, that the height of the building contravened local regulations by four feet, was removed by reducing the floor-to-ceiling heights throughout the building. H.M. the Queen laid a foundation stone on 19 October 1957 during her state visit to the United States. 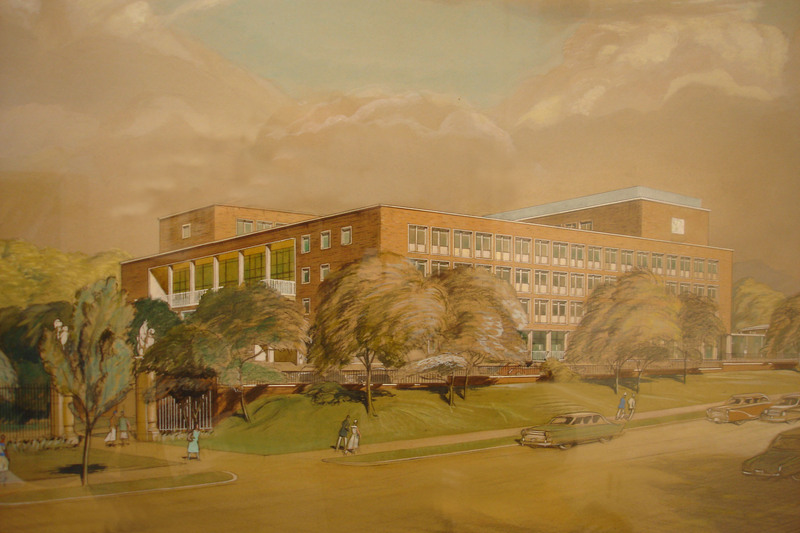 Site preparation began in 1958 with the demolition of the four storey office block put up in a hurry in 1941 on Lot 43. The war-time brick additions to Lutyens’ chancery building were removed in 1960. The Lutyens gatehouses at the Observatory Circle entrance were lowered several feet in their entirety to suit the roadway levels around the new building. The construction contract was awarded to John McShain, Washington’s pre-eminent contractor (and racehorse owner), at a contract figure of $3.3 million with a contract period of 600 consecutive days (about 20 months with full weekend working). Construction progressed pretty smoothly. The building was ready for occupation on 29 July 1960 and was opened on 23 September 1960 by Mr Selwyn Lloyd, Chancellor of the Exchequer but Foreign Secretary when asked to perform the ceremony. 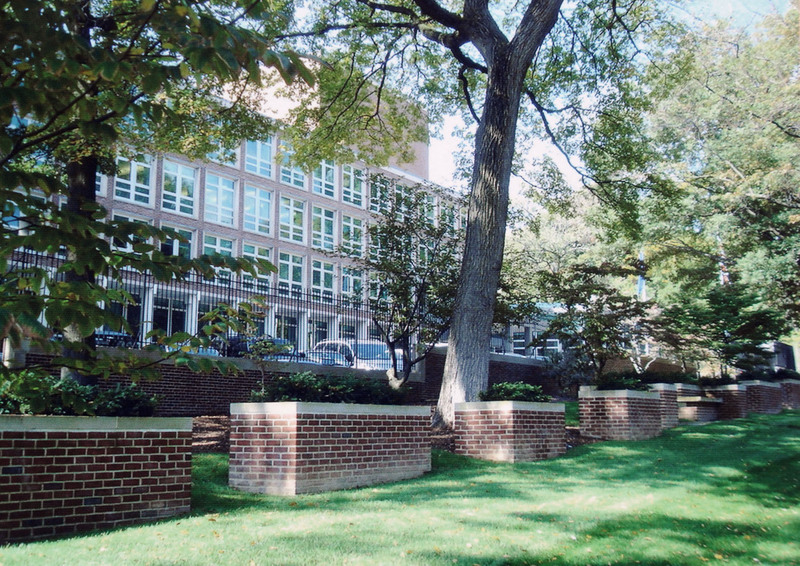 The issue of requiring British materials to be incorporated in a British embassy construction contract had arisen in Washington in mid-1957 when the commercial minister brought pressure to bear to this effect on the Ministry of Works: he specifically proposed that the facing bricks should be British. The issue cropped up on many embassy projects and was generally later laid aside when such considerations as competitive tendering, guaranteeing delivery times, and seeking waivers from import duties were further explored. The question was kicked into touch on the Washington project by agreeing that tendering contractors would merely be encouraged to use British materials. In the event, the same red brick and Indiana limestone selected for the Lutyens ensemble were used for the new offices. 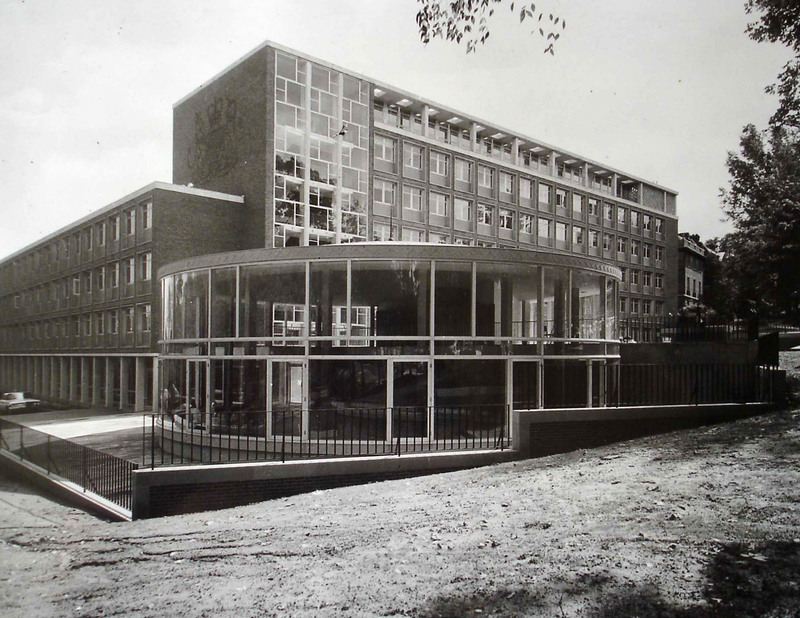 But the glazing of the ambassador’s double-height study and of the library facing Massachusetts Avenue was imported from Britain – indeed, this was the first use of float glass in the United States. And the entrance hall was partly lined with dark Purbeck marble from Messrs. Whitehead’s quarry at Swanage, in Dorset (whence also had come the 1957 foundation stone). The building’s best space is the circular Conference Hall (better known as the Rotunda) at the north corner, linked by a short glazed passage. It is 62 feet in diameter, with a slightly domed concrete roof, cast in situ, with a copper covering, supported on 16 slender free-standing concrete columns, with a completely glazed wall around. Its curtains were white satin, with a much admired design in black of Shakespearian characters. At the back was a committee room and ancillary rooms. The huge Coat of Arms (18 feet tall and 25 feet wide) engraved on the brickwork of the fifth and sixth floors facing Massachusetts Avenue, was designed by Reynold Stone of Litton Cheney, Dorset (who had designed the Arms for the Coronation Service), and carved by the sculptor Trevor Tenant of Hampstead, London. The building remains in full use, though its appearance has never satisfied anyone, least of all a New York columnist in 1960 who thought it ‘looked like nothing so much as a lying-in hospital for wayward girls’. Internally, except for the rotunda, it is rather oppressive and dull, not least because of the reduced floor-to-ceiling heights. On the other hand, it was strongly built, effectively serviced, and has proved operationally fairly efficient. The embassy site remains much as it became in 1960 with the completion of the new offices building, though obviously there have been numerous internal moves, changes and updates. The residence structure and services were extensively refurbished in the mid-1970s, during which the ambassador moved for almost a year to a suite in the Sheraton Park Hotel, and again around the turn of the century. 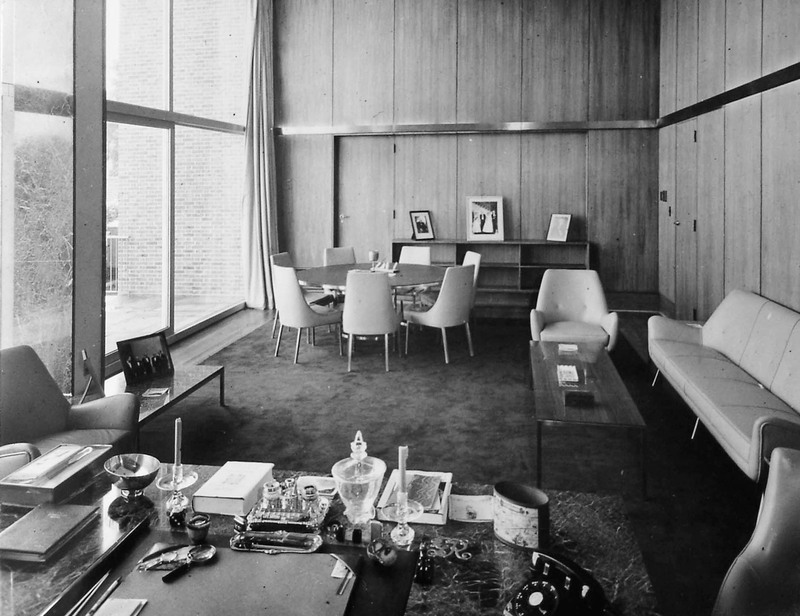 The largest residence interior initiative was the ‘Showcase’ exercise by Lady Mary Henderson in the early 1980s, for which several leading British interior designers and furnishers were commissioned to redecorate a major room each: John Stefanidis the ballroom, David Mlinaric the drawing room, David Hicks the library, and Laura Ashley and Jean Monro the major bedrooms. The Showcase was opened by Princess Alexandra in May 1982. Reactions were mixed and the experiment has never been repeated, either in Washington or anywhere else. Since Lutyens’ chancery building was vacated by offices in 1960 (and since when it has been known as the Old Chancery), it has never been found a really satisfactory new use although numerous attempts have been made, including residential accommodation for residence and UK-based staff, British Council offices and suchlike. The site and building of the former New Zealand embassy, considered for purchase in 1950 when it was denoted as Plot 51, was bought in 1989 and converted for use as the Visa and Consular office. 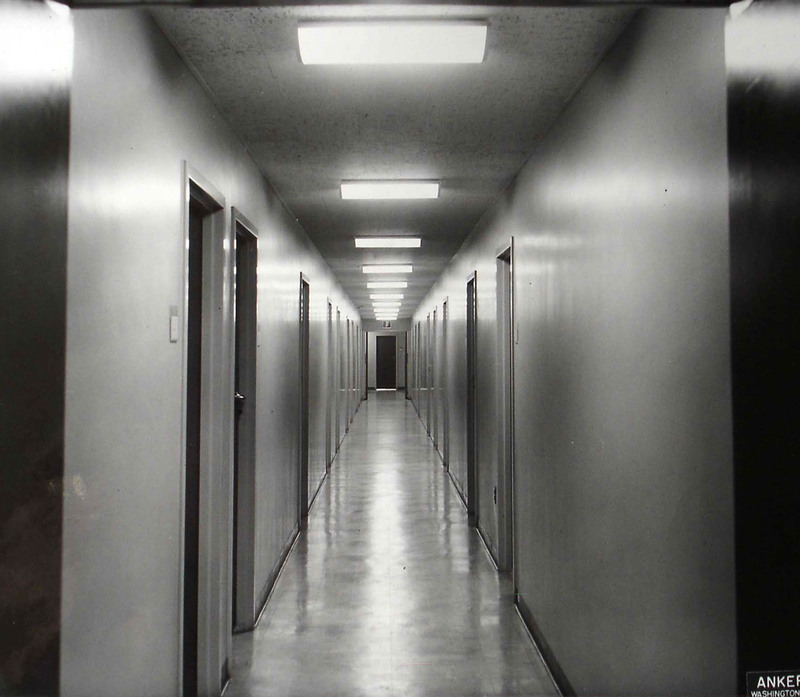 The whole of the 1960 office building was re-fenestrated for security reasons in the 1990s and, a rare happening, to beneficial aesthetic effect. The embassy site has been more affected by cars than anything else. They fill the Old Chancery court and every corner of the whole site. Various schemes have been proposed from time to time for major work on the office buildings at Washington, including their replacement. More realisable ideas have been removing the garaging from the ground floor of the square, enclosing the square as a large atrium, enclosing the court of the Old Chancery, and burying some of the carparking. But no such scheme has taken flight because the huge cost of doing anything radical would be disproportionate to the actual shortcomings of the present arrangements. I am indebted to Julia Blakely for her help with aspects of this page: her website A History of The Gardens of the Ambassador’s Residence, British Embassy, Washington is a comprehensive and stimulating account of a residence’s life. Christopher Hussey, ‘The New Embassy at Washington’, Country Life, vol 62, 24 December 1927, and ‘The British Embassy, Washington’, vol 85, 14 and 21 January 1939. Gavin Stamp and Allan Greenberg, ‘Modern Architecture as a very complex Art: the design and construction of Lutyens’s British Embassy in Washington DC’, Chapter 11 in Lutyens Abroad, London: British School at Rome, 2002. Anthony Seldon and Daniel Colling, The Architecture of Diplomacy: The British Ambassador’s residence in Washington, Flammarion, Paris, 2014. 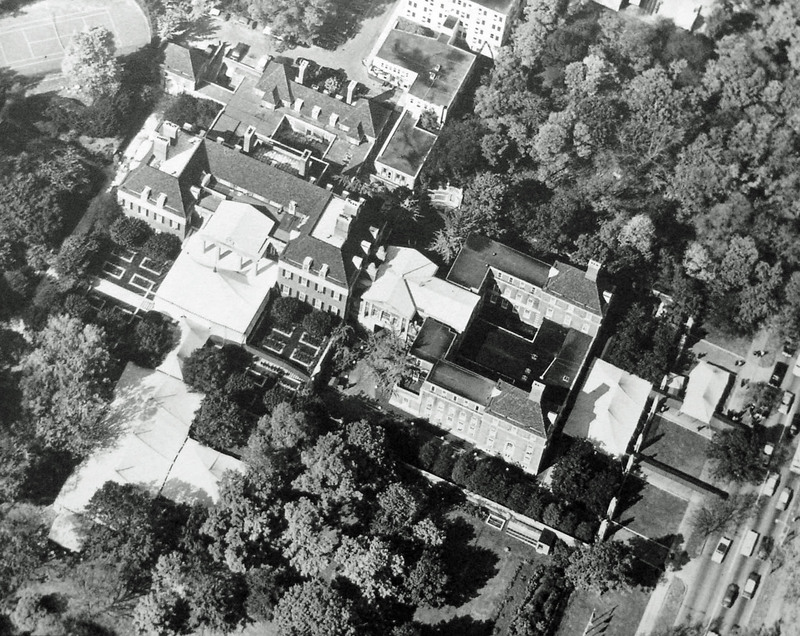 Aerial view of embassy buildings at the time of HM The Queen’s State Visit to the United States in 1957. The extensive marquees were erected for HM’s visit to the embassy, during which she laid a foundation stone for the new offices. Site plan of the new offices on the newly acquired sites to the north of Lutyens’ ensemble. 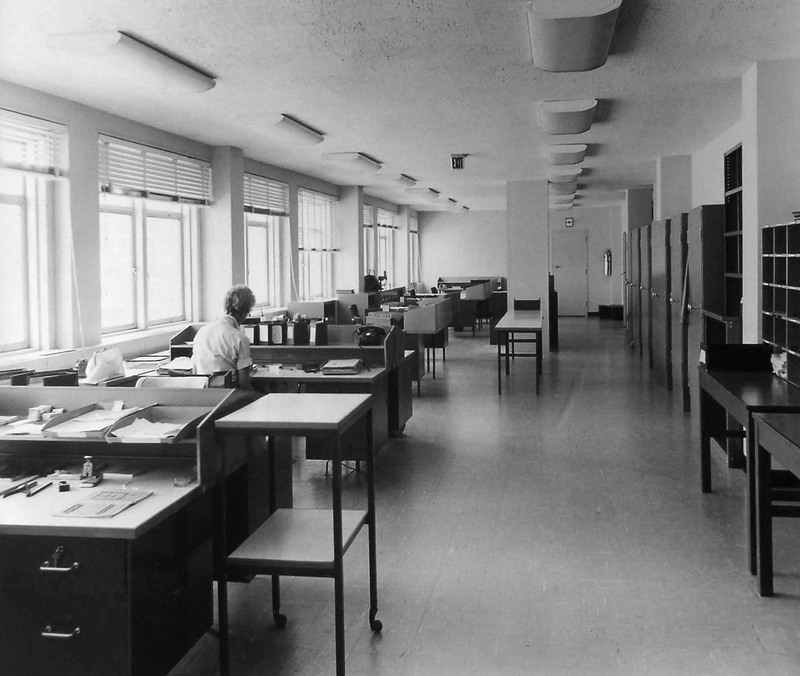 1957 perspective drawing of the new offices. 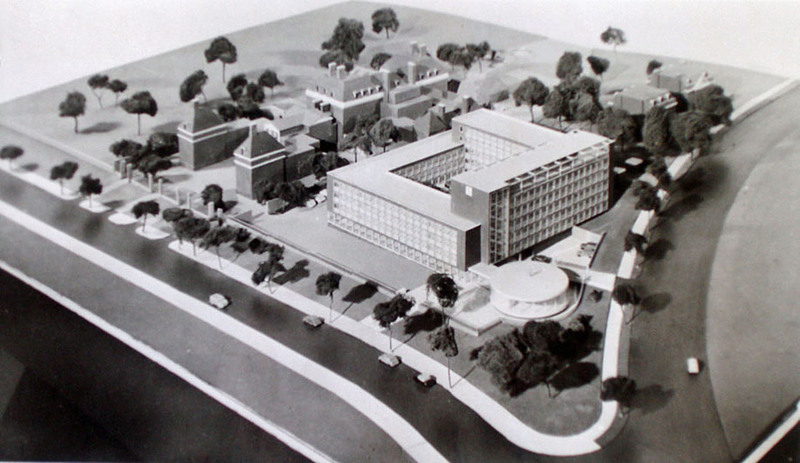 1956 model of the new offices. 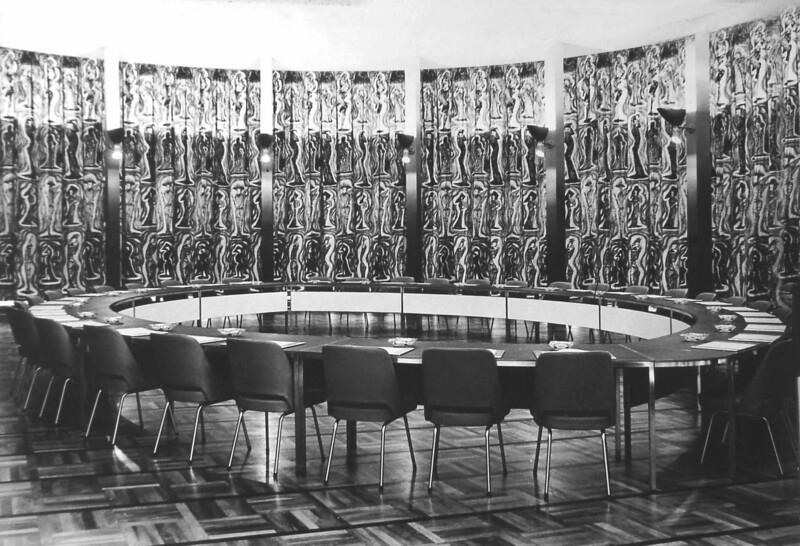 The completed offices in 1960, with the conference room – known as the Rotunda – in the foreground. Interior of the Rotunda at night, 1960. 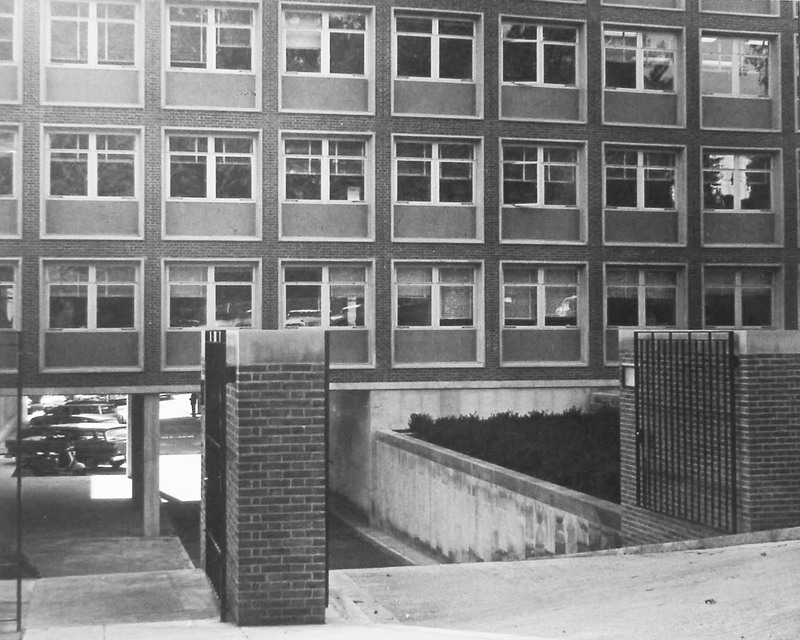 The steep 1960 vehicular entrance to the new offices building from Observatory Circle. 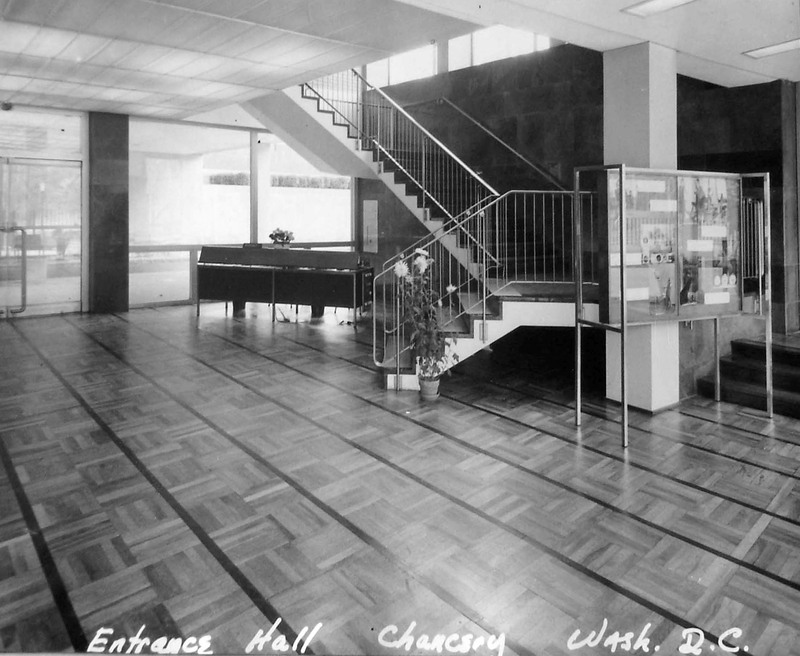 Reception desk in Entrabce Hall, 1960. 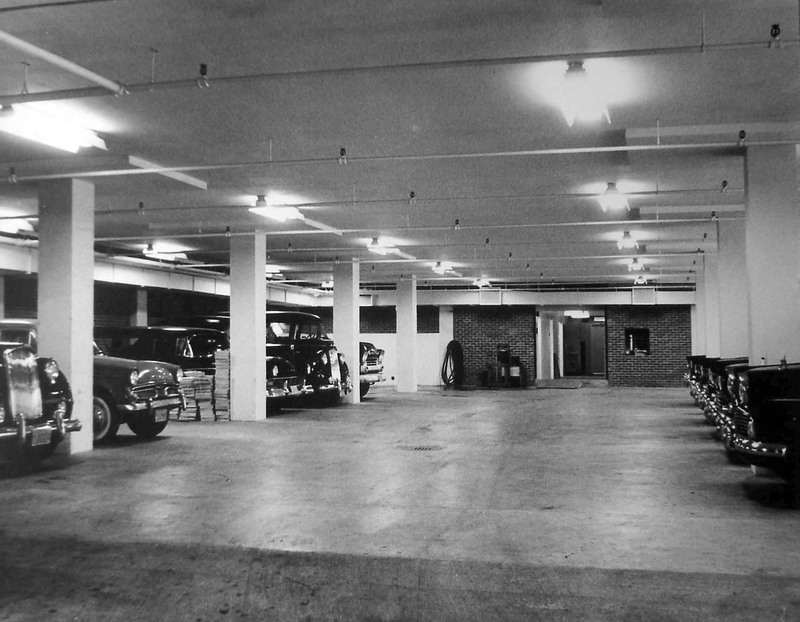 Garage for official cars, 1960. Modern strengthening of the fenestration and the site periphery has been considerately done.